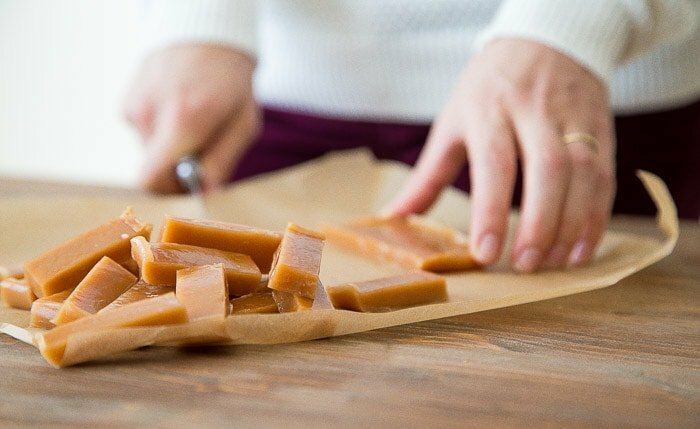 Homemade caramels from scratch, for a fun homemade holiday gift-giving! Surprisingly easy with one special tool! I’m on a homemade candy bender. It really freaks people out when you make homemade candy. I get a million questions about how this sweet treat they thought could only be bought in a store came out of my kitchen. Last week, when someone tasted my homemade marshmallows, they asked if I bought the round marshmallows at the store and melted them down to cut into squares. He was 100% serious. When I picked my jaw off the floor, I went on a homemade candy mission. I want to make small batches of your favorite candy all day! Did you see my homemade apple cider caramels? <–Love those! The only thing you need to make homemade caramels is a candy thermometer. I have one of those clip-on candy thermometers, but I also really love this one with the thermometer inside the spatula! Either will work for this recipe. For homemade chewy, sticky, creamy BEST EVER caramels, you just have to be able to boil a mixture. Twice. To two different temperatures. I think we can handle that, yes? Homemade caramels recipe, plus variations. When you make your own homemade caramels, you no longer have to ask a Trader Joe’s employee if they could give you all of the boxes of fleur de sel caramels they have in stock and a bigger shopping cart. (Guilty). I want to try making all sorts of flavored caramels now. Even if you leave the vanilla out of the batch (like I did the first time), the caramels still taste great. I’ve got my eye on apple cider caramels next. I’m not from a state with abundant apples, so I’m not well versed in apple treats, but I want to be! Would you believe I’ve never had a proper apple cider donut? I’m on a mission! Please, friends, be careful when making these caramels. Boiling things are, um, hot. Don’t burn yourself. When the sugar gets to the right temperature, move quickly but skillfully. And please, whatever you do, do not scrape the pan! You will burn your fingers! Use both hands to steady the pot of boiling hot stuff, and then be done with it. Let the caramels cool a few hours, or overnight (uncovered). A small batch of homemade caramels with just 5 ingredients. Optional sea salt sprinkle on top! Line a 9 x 5 x 3-inch bread loaf pan with parchment paper, and spray with cooking spray. In a 2-cup glass measuring cup, add the heavy cream, butter and salt. Microwave in 30 second pulses until melted and steaming. Set aside. In a 2-quart saucepan (seriously, don't use a smaller one-it boils up), add the sugar, corn syrup and water. Turn the heat to high, and cook without stirring until it reaches between 290-295 degrees. Slowly stream in the heavy cream mixture, and whisk gently. Turn the heat back to high, and cook without stirring until it reaches 240 degrees. Turn off the heat, and add the vanilla. Whisk gently to combine. Immediately pour the mixture into the loaf pan; do not scrape the bottom of the pan. Let sit for at least 30 minutes until firm but somewhat soft. This might take a few hours on humid days. You can always leave them overnight, too. Slice into desired shapes and wrap individually in wax paper. I’ve always wanted to make my own!! These look so good! They’re the most perfect caramels ever! And if you say they’re the best ever, and move over to Tj’s and any others, well I trust you! Pinned! It’s so true that people are impressed by homemade candy! I think melting store-bought marshmallows down would be more work than creating them from scratch :) These caramels look perfect! I could eat those 20 pieces myself! I’ve also not had a proper apple cider donut (and have no excuse really) – so sad! But homemade candy is absolutely THE.BEST… until I have to bust out the elastic-waist pants. Until then though, it’s the best. 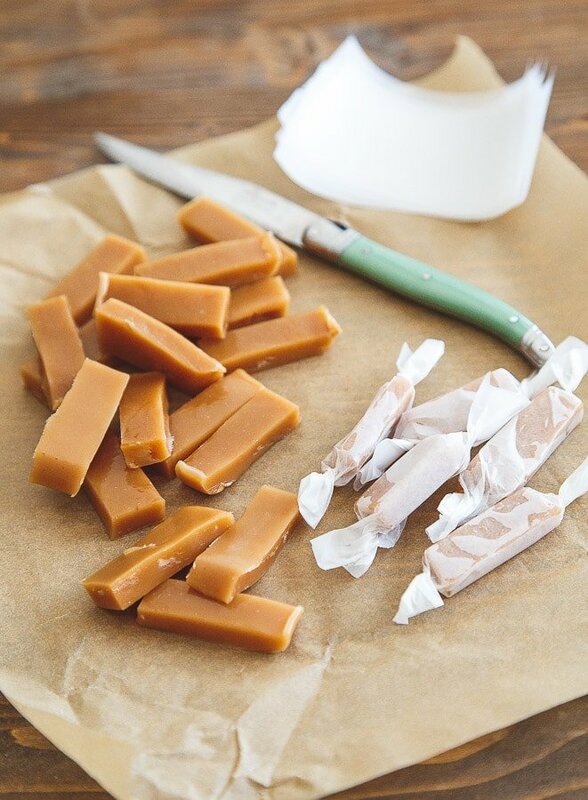 i have never attempted making homemade caramel… But this recipe looks delicious! Something I will certain try now! Thanks! I have a folder of printouts of all your recipes I am gonna try one day. These caramels are going straight to the top of the pile. By the way, my request is divinity. Thank you so much. Just a note to everyone else: I’ve sent a few advance recipes from my book to a few of you for recipe testing. No one is writing me back to tell me what they think of the recipe after making it, so I will no longer be sending any more recipes out. Sorry. These are lovely, Christina! I think homemade candy is always extra impressive since many people don’t know that you can make many confections yourself. Caramels are my absolute favorite candy. I don’t know if I could even give them out as gifts because I would probably eat the entire batch myself! I love this so much. Caramels are a favorite of mine. PLEASE adapt Smitten Kitchen’s apple cider caramels (http://smittenkitchen.com/blog/2012/10/apple-cider-caramels-the-book-is-here/) to a small batch version. I’ve made them probably 10 times, and while I absolutely adore them, the recipe just makes so freakin’ many. And yes, I know I could just cut it in half myself, but I just have never experimented with it! I just made a recipe for baked apple cider donuts for a blog I write for, and while they definitely aren’t as good as the fried version (because let’s be honest, fried donuts are always better than baked), they’re a pretty darn good substitute! Homemade caramels are the best!! I’m addicted to the eggnog version come Christmas time. homemade candy is the best . . I should make some more often. . but then that’s all my kids want to eat. . and me too. . :P love these caramels. . what about chocolate truffles? jelly beans or lollipops? I’m a total sucker for caramels especially homemade! These are definitely on my to do list, need to go and get me a thermometer then! Impressive! It must make a great gift during Christmas! 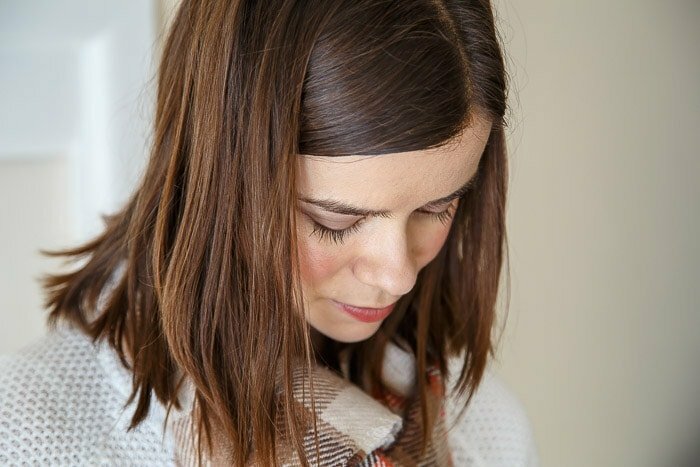 This just makes me want caramels and think of Friends and Monica’s homemade candy… and both make me oh so happy! These are perfection! haha… I would totally be that person to ask the trader joes go for all the boxes of caramels…. but not any more. What you ask? Because you rock and gave me a super easy recipe so I can make my own! Can’t wait to make… then eat! Caramels are one of my all-time favourite treats – loving these! Thank you for the recipe! Homemade caramels are the best! Yours look perfect! Plus- I love your knife! I’ve got to try caramels. Thanks for the recipe. I’ve never made them before. I’ve made candy coal, peanut brittle & English toffee. The toffee is hard, but worth the effort. So yummy. I can’t wait to try these…well, after we’re past the heat we’re currently having. As long as you’re taking requests, could you find a good taffy recipe? Many, many thanks. Homemade caramel is the best. These look absolutely wonderful. Your photos here are gorgeous. But now that I’m old, I am super into making my own marshmallows (obviously) and tried making bourbon caramels for Christmas two years ago. The result tasted good but didn’t really firm up enough to cut into pieces, so I wrapped the whole thing in plastic and took a giant slab of caramel in my carry-on, which alarmed airport security. I should have been wary of that recipe, though, because it was from Bon Appetit and BA recipes rarely work for me. This sounds a little too too easy. Easy enough to be dangerous. But on the other hand caramel is my boss’s passion. I see a promotion in my future. I have never made my own caramels before! What a great idea and recipe.. i have a feeling too that they would be perfect for the upcoming festive gift giving season. Thanks for the idea Christina! I adore caramel! Thank you for the perfect recipe to make my own! I may have to try this one. My grandmother used to make caramels at Christmas time. She always made 4 different batches…soft with & without nuts and hard with & without nuts…I guess we were a picky bunch! Try infusing some lemongrass stalks in the cream before starting the recipe. Start out with 3/4 cup of heavy cream and about six to eight stalks of lemongrass. Really bruise the stalks to release the oils before infusing. You can also add a few coins of ginger and/or kafir lime leaves for an even more “exotic” flavor. These look yum, but just one thing, what would you sub for light corn syrup? Is it like maple syrup or golden syrup? Not something we have on the shelves here. Can you use waxed paper instead of parchment paper to line the pan for the caramels. Thank you. Hi Ken, I wouldn’t. I’m worried the 250-degree mixture might melt the wax paper. Ok thank you I was just wondering . I’m going to make them today. Next month I start classes at Le Cordon Bleu in the Patisserie and Baking Program. I love making candy last week I made divinity for the first time and it turned out great. Thank you again. Christina I just made the caramels and was surprised how easy it was. They are cooling now can’t wait till tomorrow to try them. Thank you for a great recipe. These look gorgeous! I am going to have to remember this recipe come christmas as I am sure my Mother would love a huge box of them! Can you double the batch, or would you possibly have a great recipe for a large batch of delicious caramels. I’m new to your site, but I will be back! Was just wondering if the degrees was celcius or Fahrenheit? 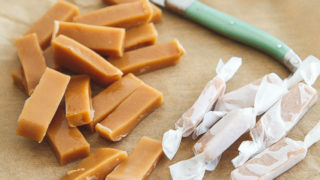 The first time I made caramel, it was the apple cider caramels that were needed for a recipe I was trying. I made the caramels first and they were so good, I never finished the initial recipe. I can’t even remember what the caramels were added to. But I kept the recipe for the apple cider caramels. Now I’m going to try yours, because plain caramels are my favorite. I have made this recipe twice, now and I love it. I have given some to all my friends and they are so impressed. I was wondering if I could add pecans to this recipe or would that call for a whole ‘nother recipe. These look delicious! I would like to make them to send out for Christmas gifts. Do they need to be refrigerated? How long are they good for? I made these last night and I’m not sure what I did wrong…but they didn’t harden much. They are somewhere between a liquid and a solid that cannot be cut. The caramels taste good, though! This looks like a great recipe! Do you think it’s possible to use the caramel in its melted state to drizzle over homemade truffles? Would that work? No, it will probably set up. Just cook it at a much lower temperature to prevent it setting up. Best of luck! Anything with caramels…YUM! Can you come up with a TWIX replicate, but small batch!? How about pecan turtle pralines!? Just made these…they are very hard with a burned taste. I have an electric flat-top stove and I think that I should have removed my pan completely off the burner (while adding my cream mixture) instead of just turning the burner off. Pretty sure I burned this batch! Ack! Sorry, SG! I used to have a flat-top stove, and oh my gosh, it stays so hot! I burned so many things on that thing! Yes, most definitely removing the pot would have helped. I’m sorry again! Those dang things run so hot. A little late to comment but just made these and they were so much better and easier than my previous caramel recipe! My husband LOVES homemade caramels but I rarely made them due to that fussy recipe. Making them again this weekend but doubling so he doesn’t go through them so fast! Thank you…I always trust your recipes implicitly! I love making homemade caramels, but hate wrapping them. I end up eating so many of them because I get tired of wrapping them up!! But, that is with my super large recipe. Do you think I could make these and pour into a small disposable aluminum pan to let the recipient cut them? Or, might the caramel get too hard if it sits too long? I want to make this for a Christmas food-gift bake sale, but don’t want to be tempted to eat the caramel..and I am pressed for time..okay, maybe lazy…fat and lazy when I end up eating the caramel. Thankfully it is a small batch. Sigh.